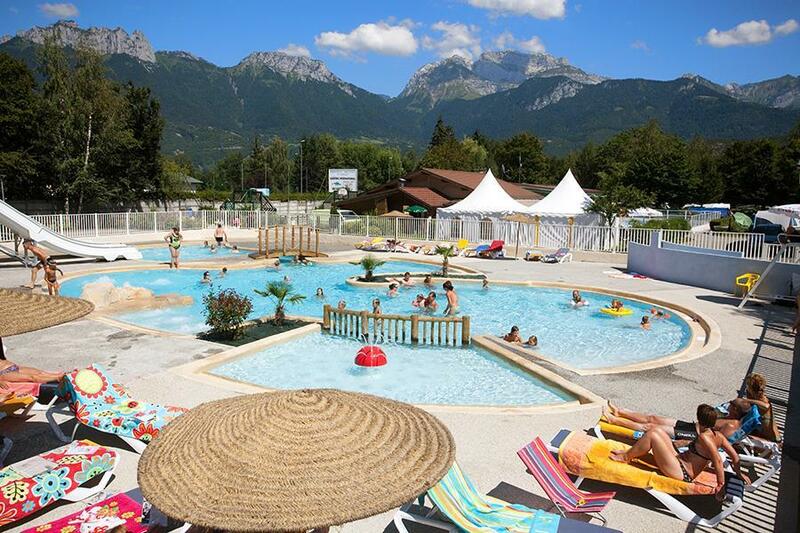 Campsite International du Lac d'Annecy is a campsite with 93 touring pitches. During low season, between 20-04-2019 - 05-07-2019 and 31-08-2019 - 14-09-2019, the nightly rate is €20,- at one of the 93 touring pitches at Campsite International du Lac d'Annecy in Saint-Jorioz (Haute-Savoie). At this campsite you can not only use your CampingCard ACSI for inexpensive camping, you can also use your ACSI Club ID (as an alternative ID). Campsite with excellent toilet facilities is an attractively lit building. Shaded pitches 400 metres from Lake Annecy and 1 km from the beach. Heated, child-friendly and tropical leisure pool with slide. Direct access to a guarded cycle path. CampingCard ACSI only on fine standard pitches. The one and only negative was the noise from the road. Lovely staff very helpful, large pitches. 10k cycle ride to the centre of Annecy along a safe mainly flat cycle path. With plenty of nice stops along the way. Perfect! We have used this site in June for many years. A well run family concern which is constantly upgraded - toilets & pool are excellent. Stunning views all around. Adjacent cycle track affords good access to local town, supermarkets and lake side, where you can take a ferry to Annecy. Adjacent road can get noisy at peak travel times. Good sized pitches are available in the ACSI period. Access good but Motorhome facilities are limited and need to be upgraded. A nice site, but some things to bear in mind, there appears to be a multi tier system - ACSI members get a smaller pitch, lower ampage elec and no water on pitch. access to the lake is across a VERY busy road, and through an industrial estate. Take care when exiting the site, as you have cross/join this busy road. We booked two pitches at the same time, and also I emailed beforehand to swop pitches to electric hook up so I thought it would be obvious we wanted to be next to each other. But on arrival we were 3 pitches away from each other. Reception staff are not that helpful really and only when I was leaving did I get service with a smile? Swimming pool was very good - water lovely and warm. Sanitaires were clean and generally above average from the many campsites I have been to. Lake beach was far away if you have small children who need to walk - not an issue if you have a pram but to Saint Jorioz it is about 35-45 min walk and to Duingt it was about 20-30 mins. Would you like to book Campsite International du Lac d'Annecy or request more information? You can do both using the information below. D1508 Annecy-Albertville. Campsite located on this road, just past the centre of St. Jorioz. CampingCard ACSI will send your information request to "Campsite International du Lac d'Annecy".